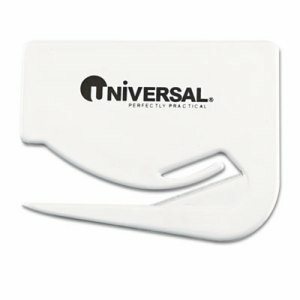 Concealed blade for ultimate safety. Simply slip slitter under flap and push forward�sharp steel blade opens envelope with ease. Keep a few in a desk drawer at work, use in a home office or carry in your briefcase. Blade Type: Concealed; Blade Material: Steel; Handle Material: Plastic; Length: 2 1/2". 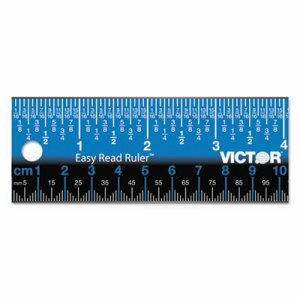 Great basic ruler for school, home or office. Double metal edge. Measures 1 3/8" wide by 3/32" thick. 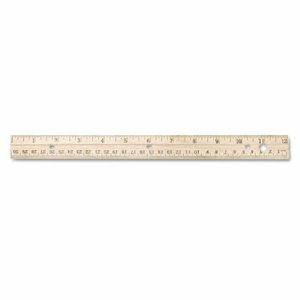 Ruler Type: Standard; Length: 12"; Standard Scale: 1/16"; Material(s): Wood. 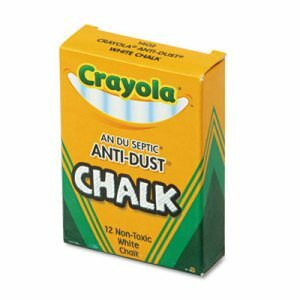 Low-dust chalk for use on most chalkboards. Makes clean, smooth lines and erases easily. Great for classrooms. Color(s): White; Number of Colors: 1; Age Recommendation: Ages 4 and up; Length: 3 1/8". Ideal companion for the Post-it� Dry Erase Surfaces or any surface which requires writing tools available on a vertical surface. The tray comes with four Command� mounting strips which will hold strongly, up to four pounds, yet remove cleanly. Damage free hanging for all your dry erase essentials. 8 1/2 x 3 x 5 1/4. For Use With: Post-it� Dry Erase Films; Material(s): Plastic. 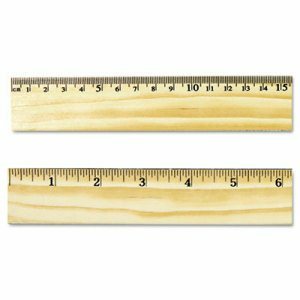 Wood Ruler with Single Metal Edge, 12" Wood Ruler with Single Metal Edge, 12"
Quality-crafted of kiln-dried lumber. Numerals and graduations are clearly delineated and checked for accuracy. Clear lacquer finish. Single brass edge. 1 5/16" wide x 1/4" thick. 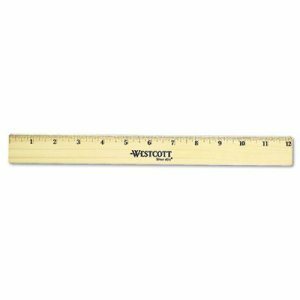 Ruler Type: Standard; Length: 12"; Standard Scale: 1/16"; Material(s): Wood. 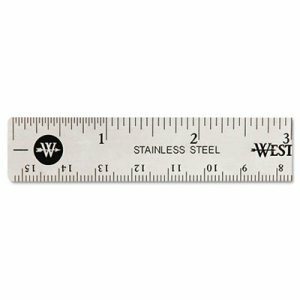 Long-lasting stainless steel ruler is right for even the toughest environments. Cork back prevents slipping. Has convenient hang-up hole. Ruler Type: Standard/Metric; Length: 12"; Standard Scale: 1/16"; Metric Scale: Centimeters; Millimeters. 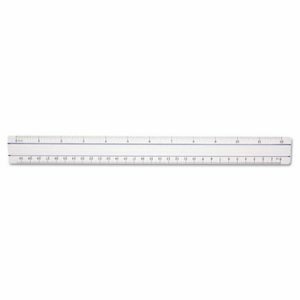 Hole Punched Wood Ruler English and Metric With Metal Edge, 12" Hole Punched Wood Ruler English and Metric With Metal Edge, 12"
Selected hardwood is finished with multiple coats of lacquer for added durability. Metal edge is ideal for straight-line cutting and for drawing clean lines. Scaled in 1/16" on one edge and millimeters on the other. 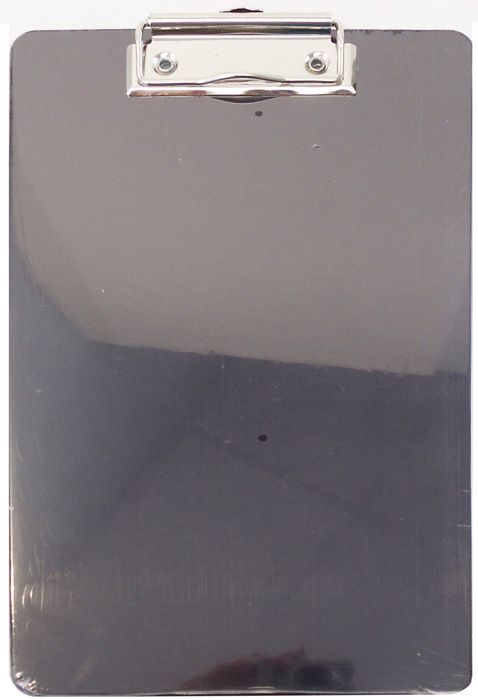 Three-hole punched for easy-access storage in a binder; hanging hole at one end. 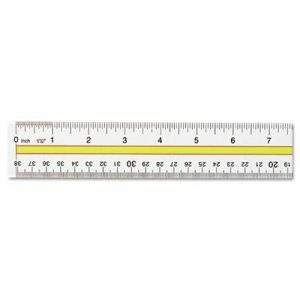 Ruler Type: Standard/Metric; Length: 12"; Standard Scale: 1/16"; Metric Scale: Millimeters. Brighten your desktop with assorted transparent jeweltone colors. Hang-up hole. Flexible, durable plastic. Ruler Type: Standard/Metric; Length: 12"; Standard Scale: 1/16"; Metric Scale: Centimeters; Millimeters. Total flexibility and clarity of measurement. 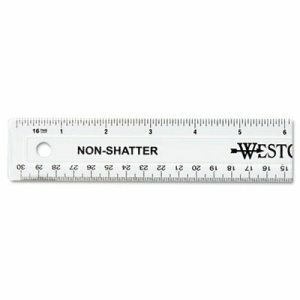 Shatter-proof plastic ruler bends, twists then returns to its original shape. Hang-up hole and clear markings. Ruler Type: Standard/Metric; Length: 12"; Standard Scale: 1/16"; Metric Scale: Centimeters; Millimeters. Designed to eliminate the confusion and strain of reading your typical ruler. The 1/4�, 1/8� and 1/16� labeled increments make it very easy to read. 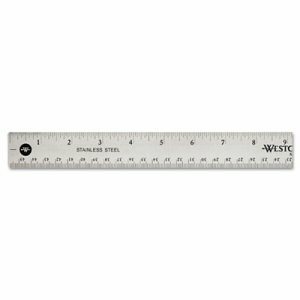 Vivid white markings and vibrant colorful backgrounds make this ruler easier to use than others in the market. The English side is colorful while metric side is black, so you always know which side you are using. The non-glare surface makes reading quick and easy. Non-slip cork backing keeps you firmly in place. Also works great as a straight edge. 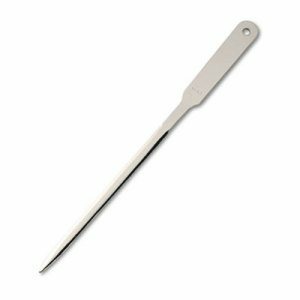 Ruler Type: Standard/Metric; Length: 18 1/4"; Standard Scale: 1/32"; Metric Scale: Millimeters. Nearly pure, 95% calcium carbonate is free of all materials that could scratch, streak or pit your board surface. Special mineral cohesion agents ensure clean, dust-free use. Standard cylindrical design fits most chalk holders. School-approved, nontoxic. Color(s): White; Number of Colors: 1; Age Recommendation: Ages 5 and Up; Length: 3 1/4". Simplify reading across computer sheets with the tinted guide. Clear plastic ruler has a see-through yellow center panel to highlight one line. Beveled edges with standard scale on one side, metric on the other. 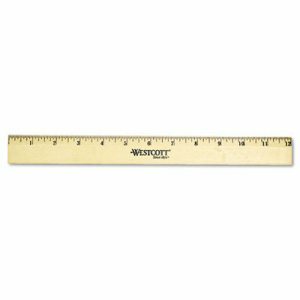 Ruler Type: Highlighting Data Rulers; Length: 15"; Standard Scale: 1/16"; Metric Scale: Centimeters; Millimeters. Transparent plastic construction. 1" wide. Ruler Type: Standard/Metric; Length: 6"; Standard Scale: 1/16"; Metric Scale: Centimeters; Millimeters. Precision-made of the finest kiln-dried lumber. Numerals and graduations are sharply delineated and checked for accuracy. Both edges are double brass. Clear lacquer finish. 1 3/8" wide x 3/32" thick. Ruler Type: Standard/Metric; Length: 12"; Standard Scale: 1/16"; Metric Scale: Centimeters; Millimeters. 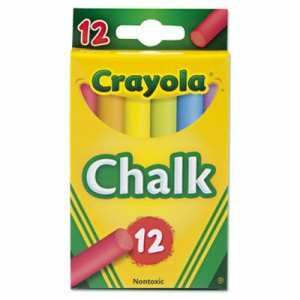 Absorbent chalk eraser is made of durable felt to effectively remove chalk writing from a blackboard both quickly and easily. Perfect for moderate-use instructional environments. 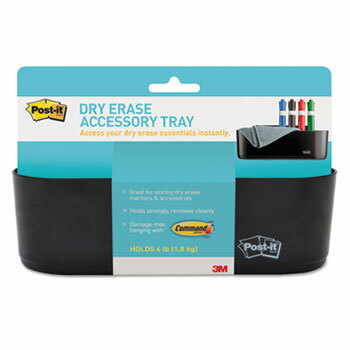 Board Eraser Type: Chalkboard; Pad Material: Felt; Width: 5"; Depth: 2". Perfect for writing and drawing on black boards. Draws smooth, clean lines. Color(s): Two sticks each of 6 colors; Number of Colors: 6; Age Recommendation: Ages 4 and up; Length: 3 1/8". Vivid, dense writing is clearly visible from longer distances in larger rooms. Durable Twin Pipe Feed System� provides consistent color intensity and ink flow. Ink markings wipe away clean from boards with no ghosting or shadows. 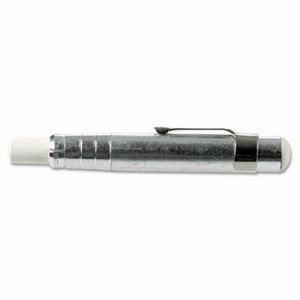 Pen Refill Type: Dry Erase Marker; Special Ink Type: Dry Erase; Refill For Series: BeGreen� V Board Master; Tip Type: Chisel. 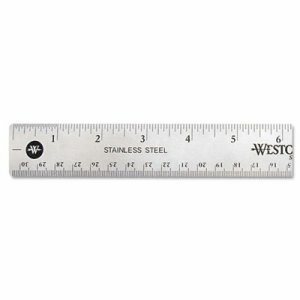 Stainless Steel Office Ruler With Non Slip Cork Base, 6" Stainless Steel Office Ruler With Non Slip Cork Base, 6"
Nearly indestructible, warp-free, bend-resistant stainless steel ruler is ideal for precision measurement tasks. Attractive, brightly yet tastefully colored finish fits right into modern office environments. 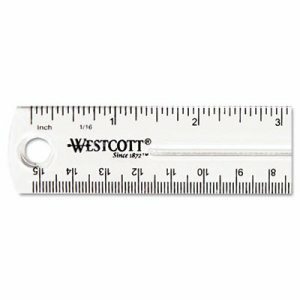 Etched, bright white standard and metric measurement markings ensure easy readability. First and last inches have 1/32-in. gradations. Drilled hook hole provides a convenient storage option. Ruler Type: Standard/Metric; Length: 6"; Standard Scale: 1/16"; 1/32"; Metric Scale: Centimeters; Millimeters. School tool kit contains eight popular tools for math class success. 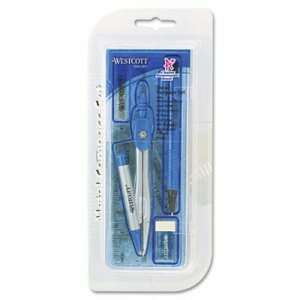 Durable plastic and metal tools withstand use from year to year. 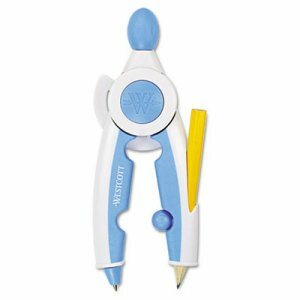 Includes two metal compasses, a mechanical pencil with lead refills, a 6" ruler, a protractor, a 45� angle triangle, a 30�-60�-90� triangle, an eraser and a pencil sharpener. Packaged in a hard plastic case to safely store all pieces. Color(s): Blue; Gray; Material(s): Metal; Plastic; Ruler Type: Standard/Metric; Standard Scale: 1/16". 2X magnifying power for easy reading. Wide 1/2" magnifying area is great for proofing text or reading. Scaled in both inches and metric graduations. Ideal for spreadsheets and analyzing data. Ruler Type: Standard/Metric; Length: 12"; Standard Scale: 1/16"; Metric Scale: Centimeters; Millimeters. Nearly pure, 95% calcium carbonate is free of all materials that could scratch, streak or pit your board surface. Special mineral cohesion agents ensure clean, dust-free use. Standard cylindrical design fits most chalk holders. School-approved, nontoxic. Color(s): Yellow; Number of Colors: 1; Age Recommendation: Ages 5 and Up; Length: 3 1/4". Nearly pure, 95% calcium carbonate is free of all materials that could scratch, streak or pit your board surface. Special mineral cohesion agents ensure clean, dust-free use. 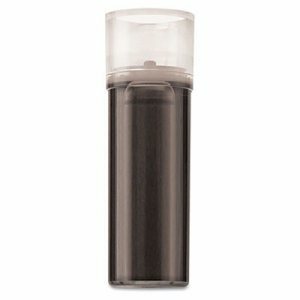 Standard cylindrical design fits most chalk holders. School-approved, nontoxic. Color(s): Assorted; Number of Colors: 6; Age Recommendation: Ages 5 and Up; Length: 3 1/4". Designed to eliminate the confusion and strain of reading your typical ruler. The 1/4�, 1/8� and 1/16� labeled increments make it very easy to read. 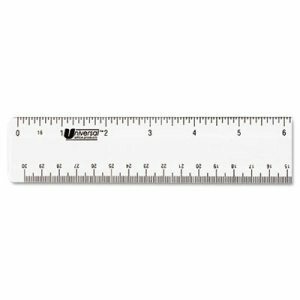 Vivid white markings and vibrant colorful backgrounds make this ruler easier to use than others in the market. The English side is colorful while metric side is black, so you always know which side you are using. The non-glare surface makes reading quick and easy. Non-slip cork backing keeps you firmly in place. Also works great as a straight edge. 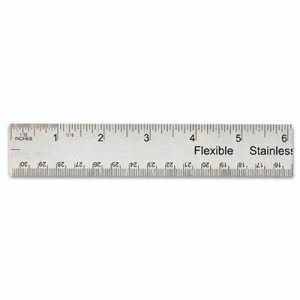 Ruler Type: Standard/Metric; Length: 12 1/2"; Standard Scale: 1/32"; Metric Scale: Millimeters. Stainless Steel Office Ruler With Non Slip Cork Base, 18" Stainless Steel Office Ruler With Non Slip Cork Base, 18"
Nearly indestructible, warp-free, bend-resistant stainless steel ruler is ideal for precision measurement tasks. Attractive, brightly yet tastefully colored finish fits right into modern office environments. Etched, bright white standard and metric measurement markings ensure easy readability. First and last inches have 1/32-in. gradations. Drilled hook hole provides a convenient storage option. Ruler Type: Standard/Metric; Length: 18"; Standard Scale: 1/16"; 1/32"; Metric Scale: Centimeters; Millimeters. Stainless Steel Office Ruler With Non Slip Cork Base, 12" Stainless Steel Office Ruler With Non Slip Cork Base, 12"
Nearly indestructible, warp-free, bend-resistant stainless steel ruler is ideal for precision measurement tasks. Attractive, brightly yet tastefully colored finish fits right into modern office environments. Etched, bright white standard and metric measurement markings ensure easy readability. First and last inches have 1/32-in. gradations. Drilled hook hole provides a convenient storage option. 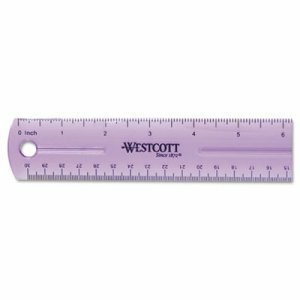 Ruler Type: Standard/Metric; Length: 12"; Standard Scale: 1/16"; 1/32"; Metric Scale: Centimeters; Millimeters. 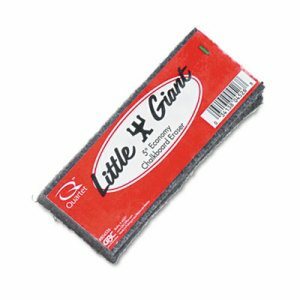 Superior chalk eraser is made of premium felt and cleans up blackboards fast without leaving a scratch. Perfect for large blackboards and high-volume teaching environments. 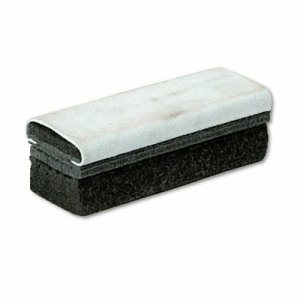 Board Eraser Type: Chalkboard; Pad Material: Felt; Width: 5"; Depth: 2".